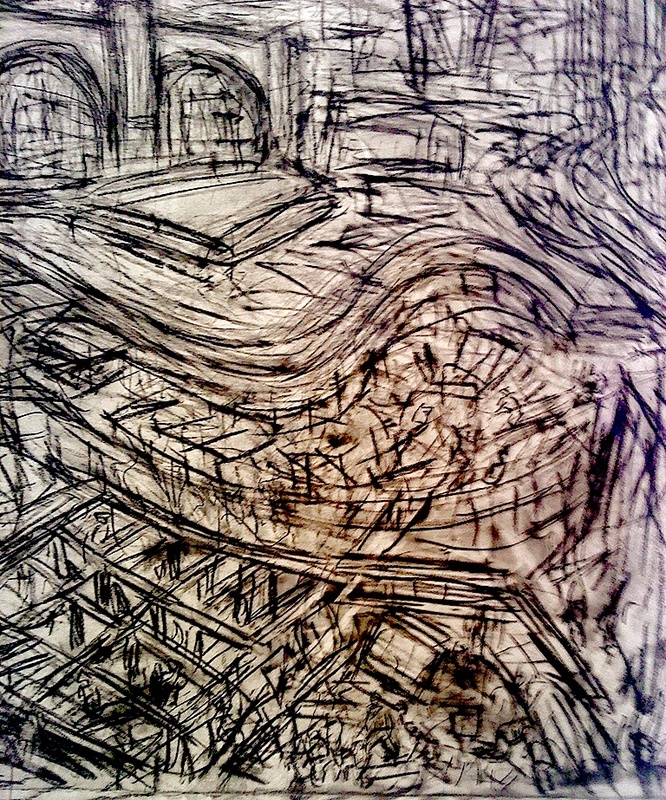 Undoubtedly the highpoint of my week was Leon Kossoff’s fantastic show at Annely Juda in Dering Street. This show has works from early in his career to the present. An almost religious vocation has driven him on for over fifty years, doggedly pursuing the same agenda. How many other artists could claim this? How many would feel so sure in their chosen idiom to pursue it when it had no commercial support or potential? Today when even artists are all so career oriented, building their list of shows and networking, how many would just stay in the studio and keep working, oblivious to all else? 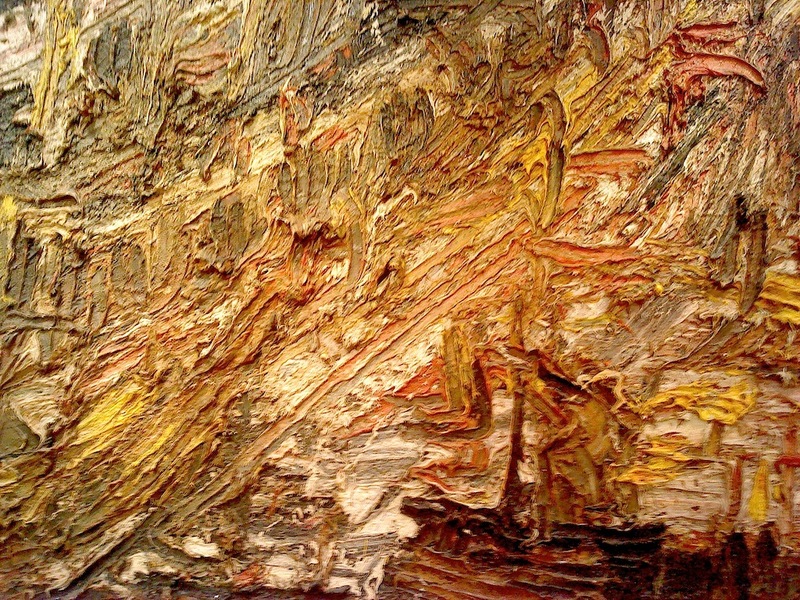 Detail from an early Kossoff painting of a building site. Seemingly the antithesis of Duchampian detachment, he pours into the work whatever he can find in himself. This is introspective work, full of unashamed personal emotion. Unassuming and shunning personal attention, he is a very different kind of artist from those who produce ‘comment’ style work requiring the audience to complete the circle of meaning: only possible in the context of the gallery. Kossoff’s work is context independent – the viewer is allowed to view but the act of viewing is not part of the work, it requires very little critical mediation because the content is actually within the work and not projected from outside. Am I in sympathy with this kind of artist more than the detached conceptualists , beloved of the current generation of curators and critics who make more of them than they deserve? Yes, in all probability. Too much attention goes to extravert bores and for someone like Kossoff who is not a natural self publicist, due respect has taken a very long time. But he has never stopped or changed direction when his work received no attention. Painting from life is an idiom that can be lazy and regressive without this strict, almost self-lacerating discipline: contemporary art has taught us this much at least. Yet this monasticism is not always a healthy approach to making art. I was lucky enough to visit his house many years ago to collect some paintings for a gallery I was working for. I smelt the linseed oil walking up the garden path. Apparently the house had just had a major clean up but there was still paint pretty much everywhere; this was an extreme lifestyle. The estimated drying time of the pictures he had just finished was about thirty years. Some of the early ones in this show will be dry by now then. He seemed exceedingly shy and quiet, not so much like his longtime friend Frank Auerbach who has a kind of intense taciturnity about him, but more withdrawn and inward looking. And I would say this is reflected in the slightly more expressionistic quality to his art. Usually I would regard that as a negative, but not here. The energy and vigour of his work is what matters. This entry was posted in Art, British, Galleries, Kings Cross, London, Modernism, Painting, Uncategorized and tagged Art, British, Duchamp, Galleries, Kings Cross, Kossoff, Painting. ← Your Move Marcel Pt II, Marcel talks back!